One of the founders of Juno-winning Indigenous electronic music group A Tribe Called Red is leaving. 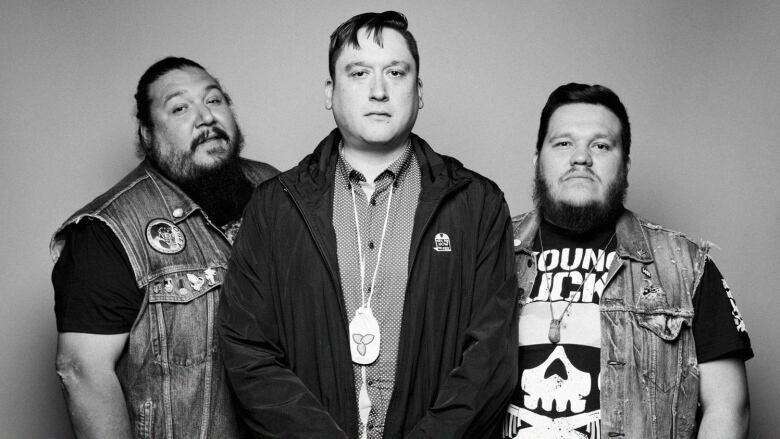 A Tribe Called Red's Ian Campeau (centre) is leaving the band, he announced on Tuesday. One of the founders of Juno-winning Indigenous electronic music group A Tribe Called Red announced Wednesday he's leaving. Ian Campeau, who performs as Deejay NDN, said that one of the reasons he's stepping aside is for his health..
"These past few years, I've spoken about how touring was difficult and triggering my anxiety and depression," he said in a message posted on Twitter. "This is the healthier choice for me." Campeau also said he'd grown apart from his bandmates. "This caused tension between us and created a toxic environment to a point I didn't feel comfortable in that working environment anymore," he said. Campeau said he wants to focus on advocacy, something he and his bandmates have done both with their music and in the media. This week the Ottawa-based group pulled their music from a sound and light show at the Chaudiè​re Falls on the Ottawa River amid criticism the event disrespects Indigenous culture. A Tribe Called Red issued their own statement on Twitter about Campeau's departure later that morning, saying collectives like theirs evolve over time and it's common for people to come and go. "We wish Ian well in continuing his personal endeavours and being able to spend more time with his family," said the band, which for the time being consists of Bear Witness and 2oolman. "The artistic and political message of A Tribe Called Red remains unchanged and we're looking forward to [creating] more music, art and positive moments for the fans, particularly Indigenous youth." DJ Shub left the group in 2014 and has been making music as a solo artist since. A Tribe Called Red won the 2017 Juno for producer of the year for their latest album We Are the Halluci Nation. That album and their two previous records were also in contention for the Polaris Prize for the best Canadian album of the year.